Text message conversation I imagined on recent trip to my local mini supermarket. - Just going to shops, can I get you anything? - Thanks! Toothpaste; Earl Grey tea; and the I-Spy book of Oxford. - …Ok. But I'm only going to the little Sainsbury's. What if they don't have it? - Then normal tea's fine. - No, I meant… what if they don't have the I-Spy book of Oxford? - Huh? Of course they'll have it! This is the middle of London! What self-respecting mini supermarket would fail to stock the I-Spy book of Oxford? - You're probably right. But, just in case? - Well. 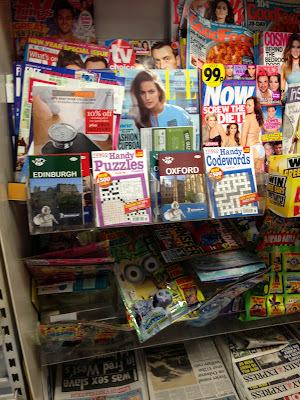 If for some strange reason they HAVE run out, just get me the I-Spy book of Edinburgh. - Radio 4 are repeating the first series of Souvenir Programme on Thursdays at 6:30, starting today. Today's includes the Three Guards sketch, and The Man Who Makes The Noise of the Tardis. - Cabin Pressure has been nominated for best comedy and also, pleasingly if slightly confusingly, best comedy drama at the BBC Audio Drama awards. I will find out which it is - if either - on January 26th. - It's also time for the comedy.co.uk awards, which are voted for by the public. If you should feel like voting for either CP or JFSP, I certainly won't stand in your way. Here is a little experiment my friend Kevin and I are trying. If it goes well, we'll do another next month. Also, I will be on The Unbelievable Truth on Radio 4 tomorrow at half past six, being untrustworthy.